In its financial report for the first quarter of 2013 published on Tuesday, T-Mobile said its earnings dipped from the year ago period, but noted a strong second quarter may be in the offing after selling 500,000 iPhones since sales of Apple's handset started on April 12. The nation's fourth-largest wireless carrier saw a 7.1 percent year-over-year decline in revenues for the quarter ending March 31, with adjusted earnings before tax, depreciation and amortization reaching $1.2 billion, down 7.5 percent, reports All Things D. The half-million iPhone sales weren't accounted for in the first quarter. T-Mobile began selling the iPhone less than one month ago on April 12, with Apple's handset debuting on the so-called "Un-Carrier's" network alongside a no-subsidy pricing structure. Under the newly formulated offerings, a 16GB iPhone 5 is sold for a $99 upfront fee, with the remaining device cost to be amortized in $20 installments spread over the following 20 months. The Un-Carrier was the last of the big-four U.S. telecoms to strike a deal with Apple to sell the iPhone. Although T-Mobile suffered a year-to-year financial dip, quarter-on-quarter numbers were up, a promising sign as the company is in the midst of building out its 4G LTE network. Our first quarter operating metrics and financial results are showing positive impact from the changes we began making in the fourth quarter," said President & CEO of T-Mobile John Legere. "We ended the quarter with strong operational momentum, which is continuing into the second quarter, driven by the successful launch of our Un-carrier Simple Choice service plan and the introduction of the iPhone into our device line-up." According to the results statement, branded customer net additions stood at 3,000 customers at the end of quarter one, with the sector showing positive growth for the first time since 2009. Branded postpaid net losses were at 199,000, an improvement of 61 percent from 2012, while branded prepaid net additions hit 202,000 customers. Attributing to the strong performance was a churn rate of 1.9 percent, the lowest since the second quarter of 2008. 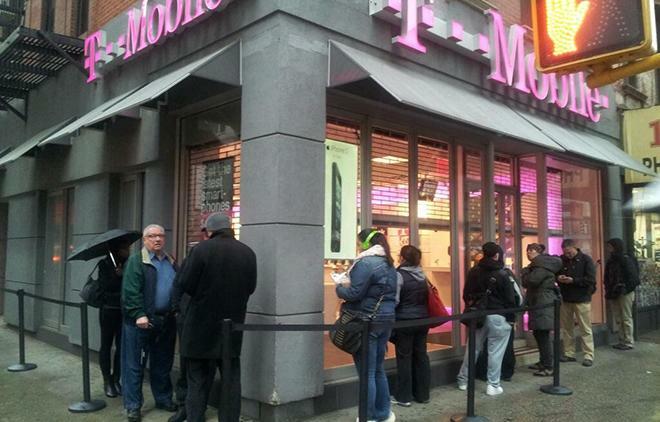 T-Mobile ended the first quarter with roughly 34 million customers, an increase of 579,000 from the end of quarter four 2012.